You're driving down the road when the "Check Engine" light comes on. Everything seems to be fine. There are no strange noises, no smoke billowing out of the car. Maybe it's nothing. Hopefully, it won't be expensive to fix. How long do you ignore the problem? A simple fix now could save you hundreds, even thousands in repair bills down the road. Benjamin Franklin's quote, "An ounce of prevention is worth a pound of cure" certainly applies. Similarly, you may be seeing warning signs of problems with your dog's health. Skin problems, dull coat, stiff joints, lack of energy… Since many diseases can stem from poor nutrition, is it time to consider a dog vitamin or supplement to their regular diet in order to avoid more serious and expensive health problems in the future? 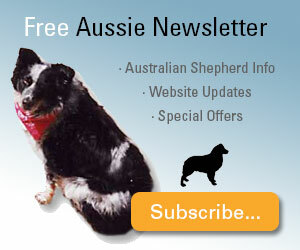 • Should you be giving a dog vitamin or supplement in the first place? • What's in a dog vitamin or supplement? 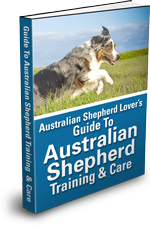 Does your Aussie need a dog vitamin or a more comprehensive dog supplement to stay healthy or slow the progress of degenerative disease? Do you really need to give your dog supplements or vitamins? If your dog is the picture of health and is getting a well balanced and nutritious diet from a high quality dog food it may not be necessary to give your dog a vitamin at all. In fact, you may actually be causing them harm as it is possible to get too much of certain vitamins and minerals. While water soluble vitamins, like Vitamin C and B1, are not generally a problem as excess amounts are eliminated in the urine, fat soluble vitamins like Vitamin A, and D can get to toxic levels so you need to be aware of the potential harm. Excess Vitamin A can cause joint pain, dehydration and damage to blood vessels while excess Vitamin D could cause your dog to stop eating, do damage to bones, and even result in atrophy of the muscles. Those are serious consequences from taking too much of what we think of as "a good thing." In addition to vitamins any dog supplement you give is likely to contain minerals as well. Again too much of certain minerals can be unhealthy. Most of us think that calcium is good, and it is in the right amounts. But too much calcium can actually cause skeletal problems. How do you know if it is safe to give dog vitamins or supplements? You know this is coming... ask your vet! Seriously. Some people may not think of giving a dog a multivitamin or mineral supplement to be a problem, but as we've seen, it certainly can be. You will also notice in this article I am referring to a "dog vitamin" or "dog supplement." That is on purpose. While some vitamins and mineral supplements intended for humans may be safe for a dog to take—others are definitely not. Instead of taking chances, why not just use products specifically formulated for dogs? Your vet may also determine that your dog is only lacking a certain vitamin or mineral and advise you to only give your dog a specific supplement rather than a full range "multivitamin." Also, your vet may recognize that it is not a vitamin or mineral that is lacking and that something else needs to be supplemented. For example, skin problems or a dull coat may be due to a lack of essential fatty acids omega-3 and omega-6. Joint stiffness and preventing/slowing progress of arthritis may be aided by Glucosamine and Chondroitin. Another reason to consult your vet is that many dog vitamin supplements can contain herbal ingredients which can interact with medications your dog is on. Your vet should also be made aware of any supplements you are giving before they prescribe a medication. 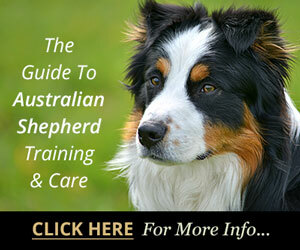 Discuss with your vet whether a targeted approach or a "multi" approach would be better for your dog. As with any product—some are better than others. With dog food it is claimed that it is nutritionally balanced and provides all the necessary ingredients to meet the requirements for your dog. That may be true and your dog may not require a supplement at all. 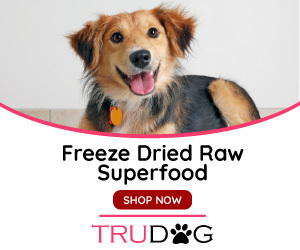 However, given the degraded quality of even human food, let alone dog food, and the almost daily revelations of corporate malfeasance, can we trust the quality and nutritional value of the food we are giving our dogs? So too with questionable manufacturers of dog vitamins and supplements. Is the quality of the source ingredients what they should be… and does it really contain the amounts claimed on the label? Just as skimping on the quality of your dog's food can lead to big trouble, skimping on the quality of your dog's supplements is a false economy that will lead to disappointment or worse. Your vet may be able to recommend a brand he or she knows to be good. 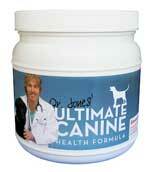 One dog vitamin supplement that is actually formulated by a vet is Dr. Jones' Ultimate Canine Health Formula. Be sure to check the "Ingredients and Benefits" tab to show the entire list of ingredients and to find out what each one does and why it has been included. This will also give you a good idea of what to look for in a dog supplement. What kinds of supplements are available for dogs? Your vet may determine that your dog only really needs a certain vitamin. You would then just give the one standalone dog vitamin rather than what is commonly called a "multi-vitamin." However, multi-vitamins usually contain more than just vitamins and include minerals like Calcium, Zinc, and Selenium. Some will also include Glucosamine, Chondroitin Sulfate, or other ingredients to help maintain and repair joints. Omega fatty acids are beneficial for a host of conditions including dermatitis, arthritis, cancer, diabetes, and kidney disease to name a few. Probiotics and probiotics are used to maintain health of the digestive tract. 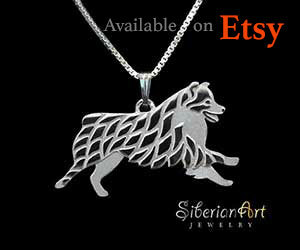 These are also available separately or as part of a more comprehensive formulation. Some dog supplements may include ingredients to help immune function. For example, Dr. Andrew Jones' formula, mentioned above, includes Colostrum, Inositol, Aloe Vera, and Maiitake to help protect the immune system. Whether you decide to target a specific issue, like giving omega fatty acids to deal with a skin problem, or decide to go with a more comprehensive formula to cover all the bases—be sure you discuss it with your veterinarian. Many commercial dog foods already include supplements and claim to provide all the nutrients necessary for good health. While this may (or may not) be true of high quality dog foods, my faith lessens as we move toward the worse and worse brands of dog food. I may be more cynical than most but I'm just wary of claims made by large, entirely profit-motivated corporations. Yes, they have a vested interest in providing good quality products, but they are also motivated to just give the appearance of quality and cut corners to reduce costs wherever possible. You do NOT want to cut costs yourself by giving your dog a cheap food and trying to make up for it by giving a dog vitamin or supplement. That would be like you eating nothing but Big Macs and Doritos and thinking you had good nutrition because you also took a multi-vitamin. I wish it could work that way, but it does not. Healthy food needs to be the foundation with supplementation added as necessary. Why not have your dog tested for nutrient deficiencies and give them what they need as a supplement or a comprehensive formula, with your vet's guidance, just to be sure. There may be a cost involved but it's worth it compared to watching your dog suffer from debilitating degenerative diseases (not to mention the vet bills). You might not be able to prevent all diseases entirely but you may at least be able to delay and slow their progress as much as possible. Besides, many of the medications and treatments for these diseases can be much more expensive than the alternative of prevention and good health for your dog. When should your dog start taking a dog vitamin or supplement? When it comes to the importance of consulting your vet about giving your dog a supplement—that goes double for puppies. It's not generally considered necessary or even safe to give a puppy supplements. Most dog food manufacturers offer special formulations for puppies and are modified specifically for the needs of a growing puppy. I know I slagged dog food manufacturers but some are actually very good. Thus the real need to get a high quality food and to work with you vet to make sure your puppy's nutrition is on track. If over-supplementing can be harmful to a dog it follows that it could be even more harmful to a puppy. So exercise caution and give your puppy vitamins or supplements therapeutically, as indicated by your vet, rather than as a matter of course. More of a good thing is not necessarily better. That said, due to the degraded quality of our food sources (for both dogs and humans) your vet may agree that a dog vitamin or comprehensive supplement may be a good idea. If you are going to make it part of your dog's overall nutrition program go ahead and get started. 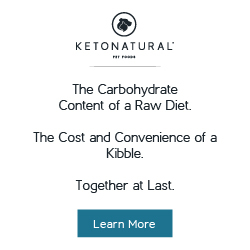 It's easy to order them online at places like Only Natural Pet, Vitality Science, and the previously mentioned Dr. Jones' Ultimate Canine Health Formula. Obviously, we want to make sure our Aussies lead happy, healthy, long lives. Considering that the foundation of health is good nutrition it makes sense that this "ounce of prevention" is preferable to the "pound of cure." 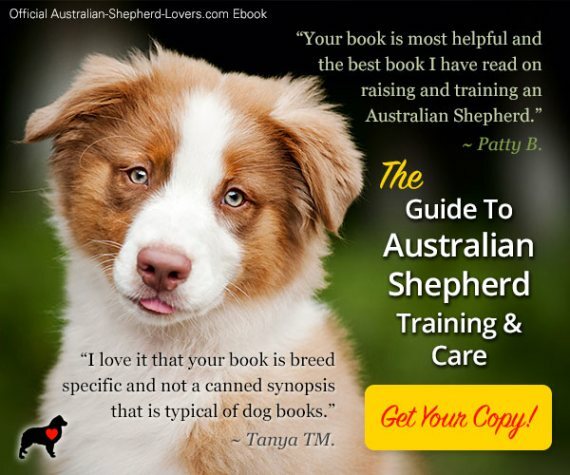 Take a serious look at the quality of dog food you are giving your dog. Can improvements be made? If so, try switching to a better quality of dog food. Then consult with your vet about adding a dog vitamin or supplement. Adding a supplement regimen to your dog's overall nutrition can be a great way to prevent or slow the progress of diseases which can be a cost-effective alternative to expensive medications and veterinary procedures.